Peter Doig’s first exhibition of new paintings in the United States in nearly ten years is being shown as a joint exhibition at two distinctive New York galleries. During these difficult economic times this artist is cleverly marketing his new work by actively choosing what he shows and where. 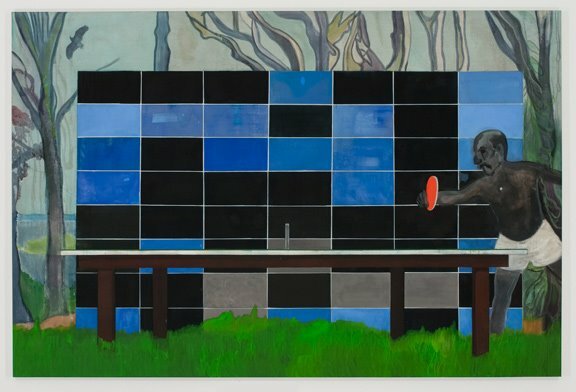 At Michael Werner’s 77th Street gallery is an intimate austere show that articulates a natural succession of paintings in Doig’s style, contrasted by the paintings at the progressive downtown Gavin Brown’s Enterprise which show Doig’s Trinidad inspired paintings and portraiture. The Upper East Side townhouse that was once occupied by legendary art dealer Leo Castelli is the very same in which we find the Michael Werner Gallery. The gallery feels more like a homely space, a narrow foyer lined with small landscape paintings, capped by a dimly lit square room featuring three large canvases. Doig’s series Man Dressed as a Bat shows a life sized abstracted yellow figure on the edge of jetty, looking out over a sea horizon. The somber colours of the dark ground and the abstracted figure are created by fluid washes of paint which permeate and saturate the canvas. The paintings at Michael Werner Gallery look like what a Doig collector would happily anticipate the new work to look like. The Gavin Brown Enterprises is a large white cube style gallery, with polished concrete floors, florescent lights and high ceilings. 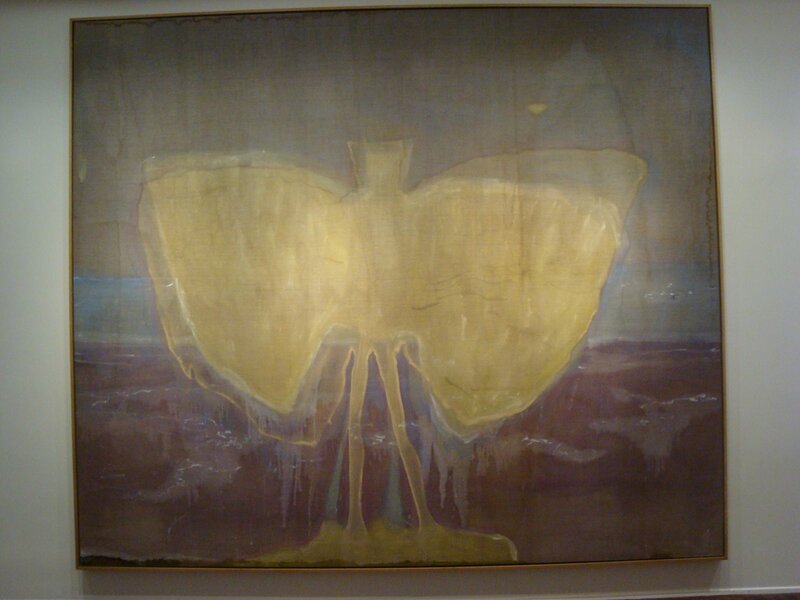 Trinidad’s affect on Doig is dramatic and reminiscent of Tahiti’s influence upon Gauguin. The large exhibition space allows Doig to ease his audience into his new work with a broad spectrum of paintings. He presents Music for the Future, a typical Doig style large painting of small houses in dark natural landscape. Doig moves us forward to Moruga, a distant town with lone figures surrounded by an overbearing Trinidad landscape. Most surprising is Doig’s concentrated foray into portraiture. There is a long wall of small portraits of a mustached man playing table tennis. These lead up to a large untitled painting of this same man in front of a bright blue checkered wall playing ping pong alone. Doig seems intent on pleasing his audience by strategically showing two very different shows in two very different spaces for the joint exhibition Peter Doig: New Paintings.